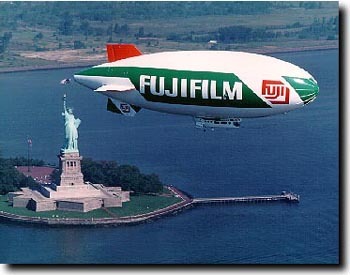 The AIRSHIP page is the one-stop source for blimp information. The gondola seats five. Rudder control is with the feet and elevator control via a wheel mounted between the seats like the trim wheel on a Cherokee. The fans rotate! This increases the ship's ability to climb and descend during takeoffs and landings. Note the air intake directly behind the fan, used for pressurizing the ballonets. View of the U.S. Tennis Open. We held this position for about three hours.